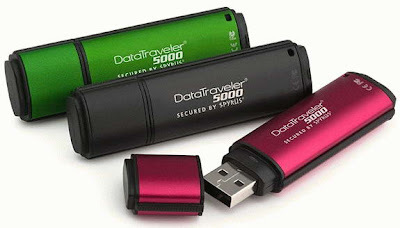 Kingston recently started the sale of their all new stylish, colorful flash drives, named Kingston DataTraveler 5000.The all new Kingston DataTraveler 5000 comes packed in a a titanium-coated stainless steel casing and a tamper-evident design. The all new Kingston DataTraveler 5000 Secure Flash Drive are designed to meet Suite B standards approved by the U.S. government.The flash drive features elliptic curve cryptography (ECC) algorithms, 256-bit AES hardware-based encryption and XTS cipher mode for better data security. The Kingston DataTraveler 5000 Flash Drive comes available in capacities of 2GB, 4GB, 8GB and 16GB.The new DataTraveler 5000 Secure Flash Drive now available in Europe with a price tag as given below. Tags:-DataTraveler 5000, Kingston DataTraveler 5000 Flash Drive price, Kingston DataTraveler 5000 Flash Drive availability, Kingston DataTraveler 5000 Flash Drive details, Kingston DataTraveler 5000 Flash Drive features, Flash Drive, Kingston, Kingston DataTraveler 5000, Kingston DT5000, Secure flash drive, USB.